This artist's concept illustrates the hottest planet yet observed in the universe. 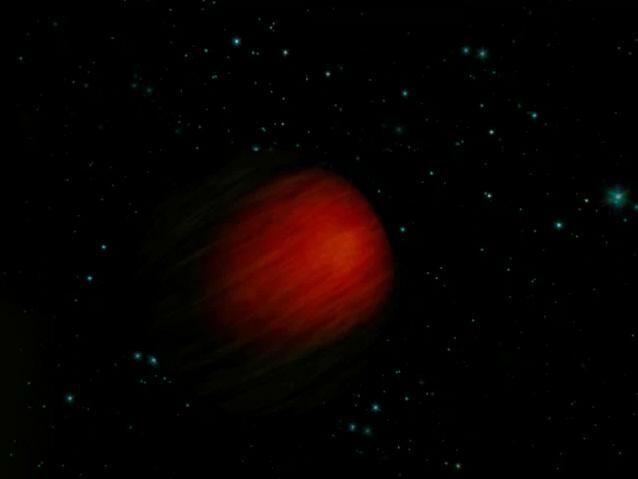 The scorching ball of gas, a "hot Jupiter" called HD 149026b, is a sweltering 3,700 degrees Fahrenheit (2,040 degrees Celsius) -- about 3 times hotter than the rocky surface of Venus, the hottest planet in our solar system. The planet is so hot that astronomers believe it is absorbing almost all of the heat from its star, and reflecting very little to no light. Objects that reflect no sunlight are black. Consequently, HD 149026b might be the blackest known planet in the universe, in addition to the hottest. The temperature of this dark and balmy planet was taken with NASA's Spitzer Space Telescope. 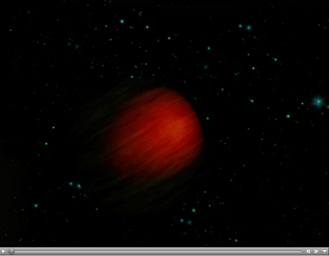 While the planet reflects no visible light, its heat causes it to radiate a little visible and a lot of infrared light. Spitzer, an infrared observatory, was able to measure this infrared light through a technique called secondary eclipse. HD 149026b is what is known as a transiting planet, which means that it crosses in front of and passes behind its star -- the secondary eclipse -- when viewed from Earth. By determining the drop in total infrared light that occurs when the planet disappears, astronomers can figure out how much infrared light is coming from the planet alone. The Spitzer observations of HD 149026b also suggest a hot spot in the middle of the side of the planet that always faces its star. Even though the planet is black, the spot would glow like a black lump of charcoal. HD 149026b is thought to be tidally locked, just as our moon is to Earth, such that one side of the planet is perpetually baked under the heat of its sun. Astronomers think that HD 149026b is probably blazing hot on its sunlit side, and much cooler on its dark side. 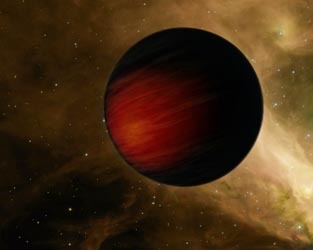 A similar phenomenon was observed previously by Spitzer for the planet Upsilon Andromedae b ( http://www.spitzer.caltech.edu/Media/releases/ssc2006-18/index.shtml ). In the case of both planets, heat is not being evenly distributed across their surfaces. This is the opposite of what happens on Jupiter, where temperature differences are minimal all around. HD 149026b is located 256 light-years away in the constellation Hercules. It is the smallest known transiting planet, with a size similar to Saturn's and a suspected dense core 70 to 90 times the mass of Earth. It speeds around its star every 2.9 days.